Lieutenant (junior grade) Robert Paul Francis Enright, USNR, was born in Bradford, Pennsylvania on September 28, 1916. In 1938 he graduated from St. Joseph's College in Philadelphia receiving a Bachelor of Arts degree. He then spent a year at the University of Pennsylvania Law School before enlisting in the US Naval Reserve V-7 Officer program on July 20, 1940. He was sent to the US Naval Reserve Midshipman's School at Northwestern University, receiving a commission as an Ensign on March 14, 1941. 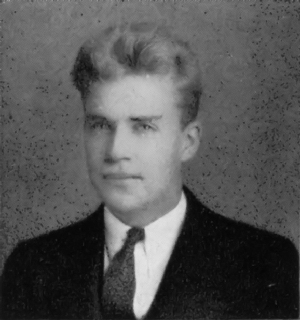 Lt. Enright reported to Mare Island, San Francisco, California and from there saw extensive duty in the South Pacific. On May 4, 1942 during the Battle of the Coral Sea, Lt. Enright served as officer-in-charge of a boat sent to rescue two downed aviators on the Japanese-occupied island of Guadalcanal. While screening the carriers during the air raids of 4 May, USS Hammann was directed to rescue two fighter pilots downed on Guadalcanal, some 40 miles (65 km) to the north. Steaming at full speed, the destroyer arrived at dusk and sighted a marker on the beach, which proved to be a parachute. The motor whaleboat was put over the side, but dangerous surf prevented it from landing. Consequently, the pilots were recovered with the use of lines from the boat. 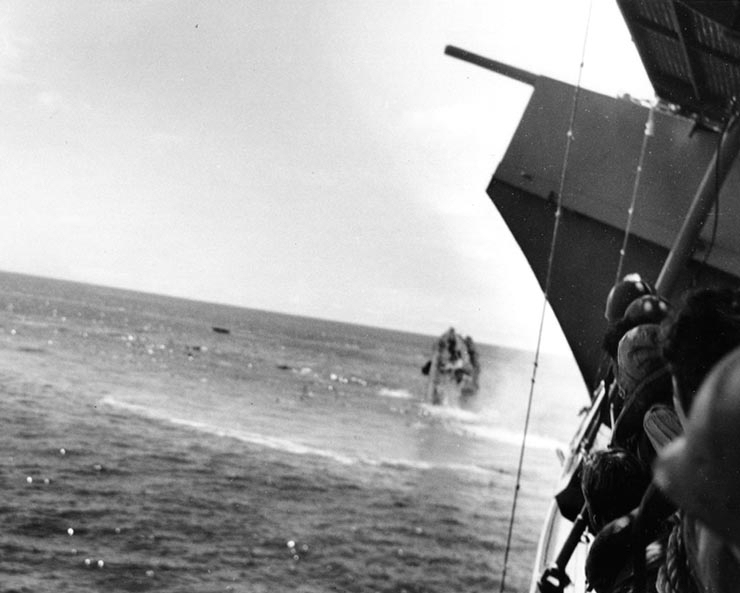 This accomplished, an attempt was made to destroy the wreckage of the aircraft, but the rough water made this impossible, and USS Hammann returned to aircraft carrier USS Lexington's screen from this successful operation that night. From his actions, Lt. Enright was recognized for his extremely heroic and courageous conduct. On June 6, 1942, in the South Pacific during the Battle of Midway Lt. Enright's destroyer, the USS Hammann (DD-412) was assisting the bomb-damaged aircraft carrier USS Yorktown (CV-5). During this operation Lt. Enright was killed-in-action when the USS Hammann was torpedoed and sunk by Japanese submarine I-168. For Lt. Enright's heroic duty at Guadalcanal, he was posthumously awarded the Navy and Marine Corps Medal. 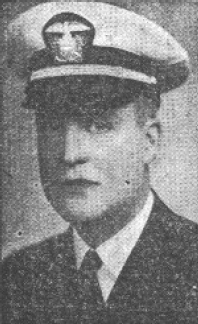 As a result of being killed-in-action during the sinking of the USS Hammann, Lt. Enright was posthumously awarded the Purple Heart. 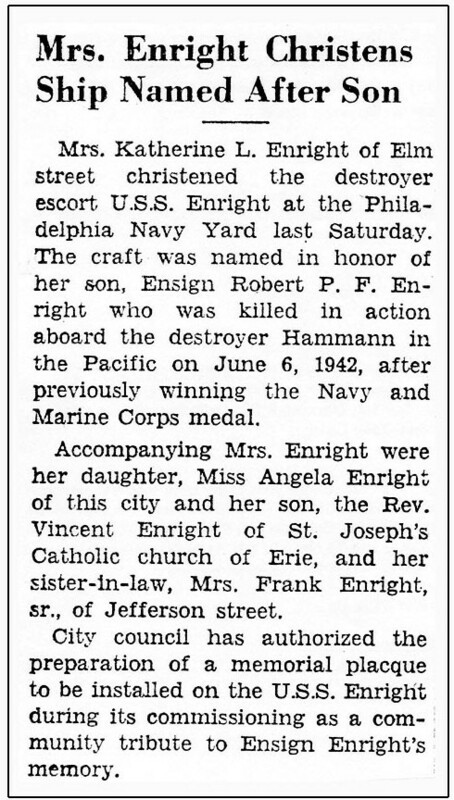 His mother, Katherine Enright Christened the USS Enright, named in honor of her son, on May 29, 1943, in their home state of Pennsylvania at the Philadelphia Naval Shipyard. 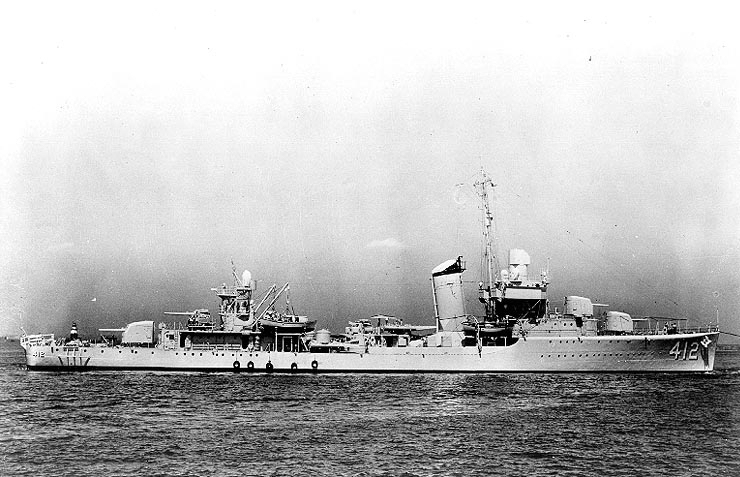 Robert's family attended the Commissioning ceremony on September 21, 1943, also at the Philadelphia Naval Shipyard. USS Hammann (DD-412) sinking after being torpedoed by Japanese submarine I-168 during the Battle of Midway on June 6, 1942. Photo taken from the aircraft carrier USS Yorktown (CV-5). Information courtesy of "Dictionary of American Naval Fighting Ships" (1969). USS Hammann action during the Battle of the Coral Sea and USS Hammann photo courtesy of Wikipedia and the US National Archives. I knew Robert Enright when he was a Lieutenant and Deck Officer on the USS Hammann. I did not have much contact with him, as I was in fire room. About the same time as his pick up of the two American pilots on enemy beach at Guadalcanal, we sank a small Japanese troop ship between Guadalcanal and Tulagi. He put out in our whaleboat to pick up one or two Japs for information. When one of our men, BM Jassen put his hand down to pull him [Japanese soldier from sunken troop ship] aboard, the guy slashed his arm real bad. Jassen drew his 45-caliber revolver and put one in his head. Yes, Robert Enright was well liked and had all our respect as a man among men. I was very proud to hear they named a ship after him. Proud to have served with him. --- USS Hammann shipmate/survivor Jay Plaisted of Portland Oregon; as told to Lt. Robert Enright's cousin Jim Enright. Robert Enright was born in Bradford, Pennsylvania on September 28, 1916. Bradford is located in northern Pennsylvania, very close to the New York state border. Bradford is the home of the famous Zippo Lighter. Bob was one of five children of Mark V. and Katherine Chase Enright. Bob had two sisters Mary and Angela, as well as two brothers, Vincent and John (who passed away at age 16). The Enright family home (which still stands today) was at 9 Elm Street in Bradford. Bradford, Pennsylvania is in the heart of the oil region of the state. The Enrights (Bob's father Mark Enright and Mark's two siblings) were oil producers, with oil leases on several properties in the mountains surrounding the town. The oil production provided modest incomes for all three families. Bob Enright was an avid Boy Scout and Sea Scout. His father Mark passed away in 1930, when Bob was 14 years old. Bob had lots of liveliness, personality, and energy. Bob's older brother Vincent (more commonly known by his middle name Les) became a priest in the Roman Catholic church. Fr. Les told the story that when he was studying for the priesthood and would be visiting home, Bob would dress up in his brother's priest vestments and swish around to the family's mixed horror and amusement. On one occasion Bob answered the door in the vestments and horrified a neighbor lady. Bob graduated from St. Bernard high school in Bradford. He was the Class President and played right guard on the football team. As was common during the 1930's, Bob's high school yearbook contains many humorous items and sayings. Listed below are several items which relate to Bob, taken from his senior year yearbook, "The Gist." Robert Enright leaves his mechanical–tinkering talent to John Hannon and Robert Flaherty. "Seniors' and Teachers' Favorite Expressions"
"Our Pick for the Seniors"
Is it because of Bob Enright's dropping his ring in Trig class? When William Doughery and Bob Enright weren't together? When Bob Enright didn't have toys in school? Robert Enright agreeing with Sister Joseph Mary? Father Ward: "Tell me about The Flood and the landing of the Ark on Mount Ararat." Robert Enright: "Father, I haven't seen the paper for two days." Family stories always had it that Bob's social life cut a wide swath through his college years. When WWII came around, Bob had grown up and didn't hesitate to answer the call. His energy and leadership qualities served him and his country very well. -- Youth and family stories courtesy of Kathie Enright Boucher and Mardi Karr.